I think my idea of finding information for my talk about new designers using specifically Russian textiles, with references to traditional Russian motifs and forms, is unrealistic. It seems this approach is out of date. In the last quarter of the 20th century many Russian couturiers did base their collections around references to their own style heritage. 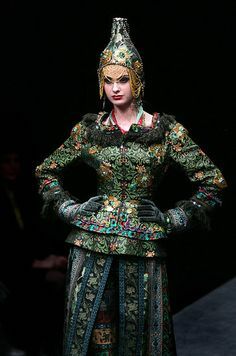 I don’t think this was because they were somewhat insular, but rather that they had their eye on potential foreign customers – that they were aware of the West’s fascination with the exotic East (ie Eastern Europe, rather than the Far East..), and love of the folk/ethnic/peasant look, that never seems to go away entirely. But now Russian designers aspire to succeed in the global marketplace without drawing attention to their ‘Russian-ness’. Are you annoyed about the exploitation by Russian fashion designers of their Russian roots and national identity? Maybe they should become more West-oriented? IC: I’m sure that the West is no longer interested in Russian dolls, traditional primitivistic style or ear-flapped fur hats. The world fashion industry is ready for the period when Russian designers will be judged not only by ethnographic factors but from a perspective of their topicality, relevance, quality – that is, the same which applies to Holland, Belgium or Italian fashion designers. I like the comments of the Russian Fashion Blog blogger, who is clearly much younger than either Chapurin or me. She refreshingly suggests that this looking back – even mentioning it in order to dismiss it – is irrelevant (and irritating) to today’s fashion scene in Russia. My good friend Djurdja Bartlett, who lectures at the London College of Fashion and has written extensively about fashion in eastern Europe and its relationship with the West, began her own blog in 2012 with a post discussing this issue of ‘ethnic style’ – ‘Is there time and place for national aesthetics in fashion? 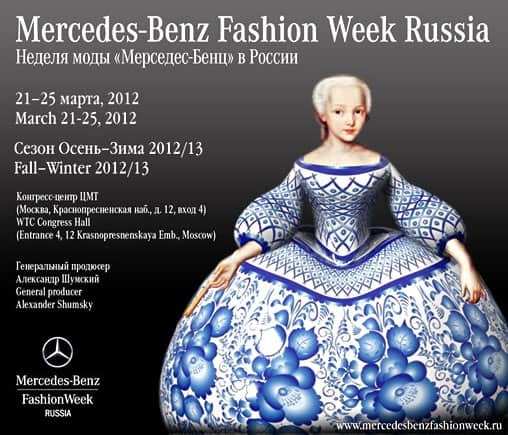 : the case of Russian fashion designers’.